i use the GFS partition as document-root for my webserver (Apache). maybe in the future i will implement it using SAN, iSCSI or GNBD but for now it’s good with DRBD and GFS as two nodes with load balancer and it’s fast enough. change /dev/xvdb1 to your partition (make sure it doesn’t contain any needed data). remember that i use Xen kernel. Memorizing module configuration … done. – for lower-level storage i use a simple setup, both hosts have a free (currently unused) partition named /dev/xvdb1 and i use internal meta data. note that “become-primary-on both” startup option is needed in Primary/Primary configuration. this device, and that randomer number and the devices size will be sent. – cman : it will run ccsd, fenced, dlm and openais. in the ‘Sts’ column the ‘M’ means that every thing is going fine, if it’s ‘X’ then there is a problem happend..
did you noticed Clustered yes? This will destroy any data on /dev/my-vol/my-lv. notice “st:Primary/Primary” it’s what we want! works great, thx a lot! What happens when a node crashes… does the other one still work? What happens when the crashed node goes up? yes, the other node will work without any problem, but when it back online you must do a manually recovery. I’ll try to do the same thing tonight to see what happens. Now that you have almost a year of using this setup – how stable is it for you? Did you have cases of one of the nodes crashing (for any reason) and recovering? What did you have to do to get it back? for now we expanded the number of nodes, now we use 4 nodes, so drbd didn’t help us in this setup, i used GFS and GNBD from redhat to setup this, 1 GNBD server as storage, and 3 Nodes running Apache. ive used this setup and doing some tests with drbd. ive noticed that when i write a large file (>500M or so) to /mnt on node1, for example, i/o to the filesystem is stalled on node2 until drbd has completed replication of the file. for instance, if i cp a file to /mnt on node1 it will write at full local I/O speed and complete the write.. however, node1’s I/o is hangng until drbd catches up with the filesystem.. is this normal? is there a way to tweak this? changing drbd protocol perhaps? this is my first setup and have only spend an hour or so testing it. curious..
Hi Shaker, how about heartbeat..? i try to combine it with drbd using ip alias. but i confuse to make them primary-primay node and build a load balancer to distribute the load.. any tutorials may be..? thanks a lot..! what you are confused of? 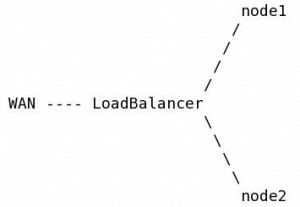 i think if you don’t really need them load balanced (your application can run in one server) then don’t make them primary and stay with Active/Passive solution. you need a tut. about what exactly? i’ve succeed make it in primary/secondary mode. but, i want all loads from the clients automatically balanced to both nodes and when one of nodes fails, the active node automatically becomes a primary one..
now i’m building a clustered server for my web and database server. 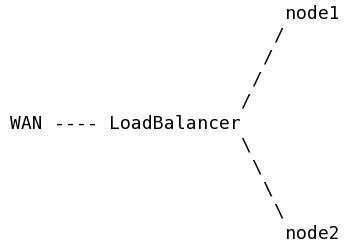 it needs a load balancer to handle the loads from clients and synchronizing data on both nodes. i use heartbeat and drbd.. am i need a GFS service to solve my problems..? Cong. on building your Primary/Secondary arch. what are you asking for is what this document explains, there is no Secondary at all in this setup, two nodes are Primary, but i think you have to consider many problems may appear from this setup, specially when one of the nodes became down, please read more about it. a Clustered setup means that you need a file system that support clustering, and this why GFS is needed. I suggest you to stay with Primary/Secondary unless you really needs Primary/Primary setup. ok, i become clear.. thanks for the suggestions.. Are u a network administrator..? Have a nice job Shaik!! and share many nice documents more..
Really superb and very usefull for every learner. Thanks a lot. Could you please post the redhar cluster configuration also if you have done. I don’t understand how does load balance work. Who does load balance? .. GFS? Hi Hamilton, actually I’m not understanding your question, but GFS have nothing with balancing, In this post, the load balancer is hardware load balancer, doing balancing for HTTP between two Apache Nodes. Such a great article you did here, the configuration of drbd is more clear to me now. – I don’t really understand the utility of the GFS system on a partition. Is it a lock manager ? I’m sorry if I’m not perfectly clear, I’m trying to translate my thoughts as much as I can.